There are a million different things to see and do around the Puget Sound area, but only so many of those will absolutely blow your mind. 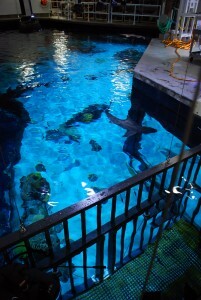 An Eye-to-Eye Shark Dive at Point Defiance Zoo & Aquarium in Tacoma is one of those experiences. It’s unlike anything I’ve ever done before, and unless I sign up again in the future, it’s nothing I’ll ever experience again. To answer the question we’re most often asked — yes, anyone can take part in an Eye-to-Eye Shark Dive at Point Defiance Zoo & Aquarium. There are two different types of dives: one for certified scuba divers (you must be 15-years-old or older) that allows you to actually swim through the tank with the sharks, and a “cage dive” option for non-certified scuba divers (you must be 8-years-old or older). 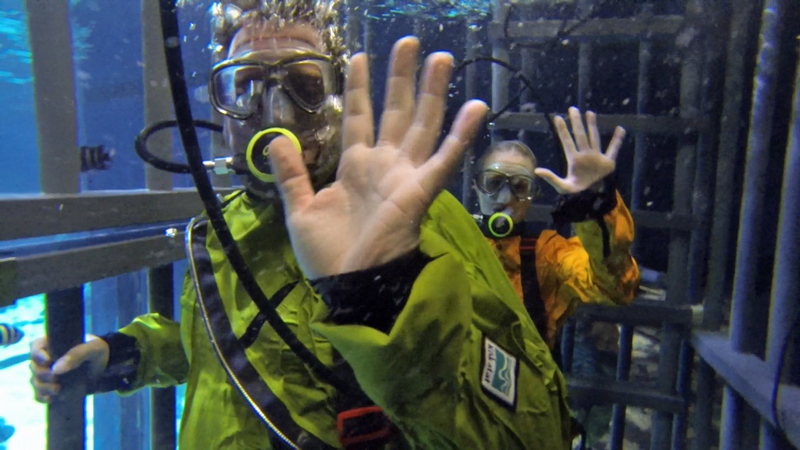 Tove and I had no previous scuba diving experience, so we jumped in a cage with the sharks. Point Defiance Zoo & Aquarium makes the Eye-to-Eye Shark Dive really easy. You show up, they take you to a room behind the South Pacific Aquarium, tell you everything you need to know about your upcoming experience, and then suit you up. Point Defiance Zoo & Aquarium equips you with everything you need for your Eye-to-Eye Shark Dive. The dry suits go right over your clothes, so there’s no need to even change. I was wearing jeans and a sweatshirt under my suit and my clothes stayed dry through the entire experience. If you have any questions or concerns about your dive, the staff is extremely friendly and happy to help you with whatever you need. Once you’re fully equipped with gear and a weight belt, it’s time for your Eye-to-Eye Shark Dive at Point Defiance Zoo & Aquarium. This is easily one of the coolest things I’ve ever done in my life (you might hear me say this a few more times — just fair warning). When you’re in the tank, you’re honestly looking eye-to-eye with these incredible animals. The sharks swim all around you for the 20 minutes you’re underwater. 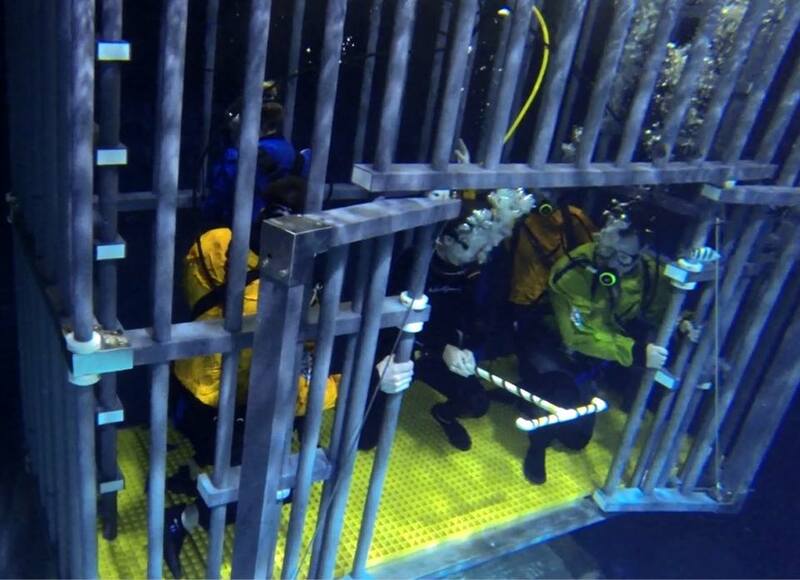 If your group (we were in the cage with another couple from Tacoma) is okay with the idea, the employee that’s in the water with you will open the cage door. That was easily the best part to me, because it allowed for an unobstructed view into the shark tank. There are six different types of sharks (and 17 total) you see on the Eye-to-Eye Shark Dive at Point Defiance Zoo & Aquarium: nurse sharks, sandbar sharks, sand tiger sharks, a blacktip reef shark, a Japanese wobbegong, and an amazing 9-foot lemon shark. 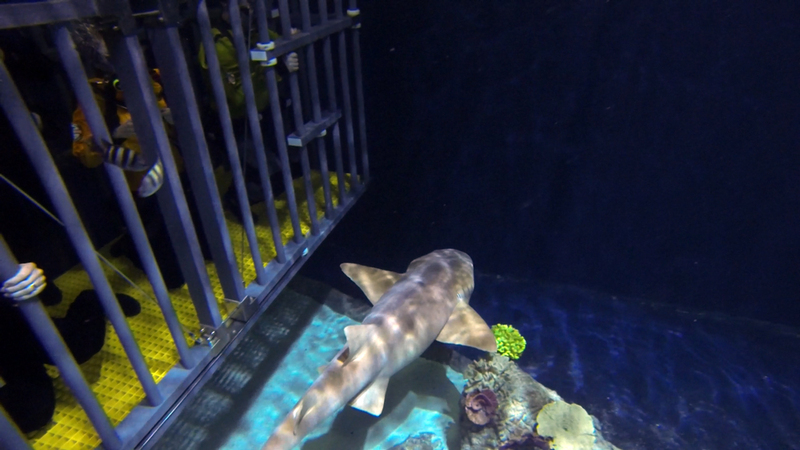 While several of the sharks lay low at the bottom of the tank, many of them come right up to the cage. They’re honestly swimming just feet away from you. It’s absolutely breathtaking to be that close to a shark, and it’s not something you can experience everywhere. In fact, Point Defiance Zoo & Aquarium is one of only two aquariums in the United States to offer an Eye-to-Eye Shark Dive. NOTE: This is just a heads up for anyone who is interested — Point Defiance Zoo & Aquarium feeds their sharks on Tuesdays and Saturdays at 11am. We hear it’s a pretty cool thing to see. Luckily, none of the sharks seemed too interested in eating us while we were in the water. In fact, there was never a moment I was scared during our Eye-to-Eye Shark Dive. I felt 100% safe the whole time. The entire Eye-to-Eye Shark Dive experience lasts about an hour and a half. That includes the time it takes to get ready for the dive, the dive itself, and then a quick educational session after the dive. The whole point of the Eye-to-Eye Shark Dive at Point Defiance Zoo & Aquarium is to offer an experience of a lifetime, but also teach people about sharks and how we can help save their population (they’re being killed at an extreme rate — mostly for shark fin soup). What Tove and I both took away from our dive: sharks are not the terrifying creatures they’re made out to be, instead they’re really incredible and harmless (to humans — not other fish) creatures. 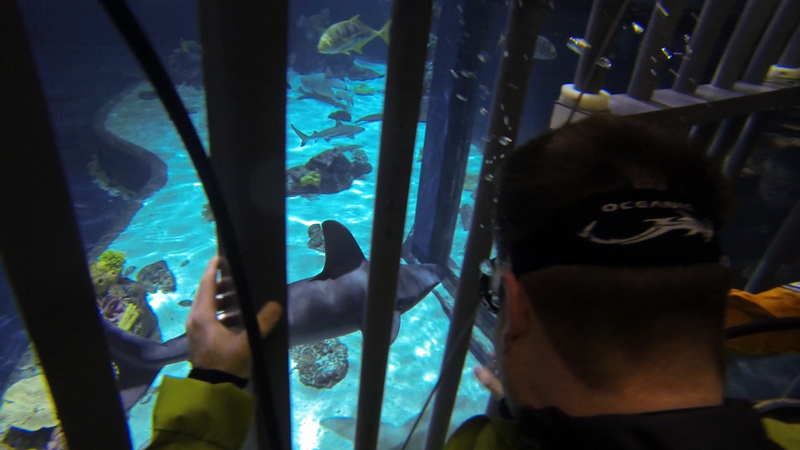 The Eye-to-Eye Shark Dive at Point Defiance Zoo & Aquarium comes at a cost, but it’s not nearly as extreme as you might think. 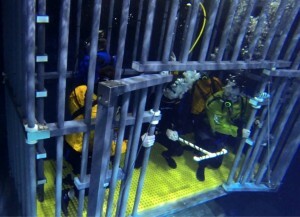 A cage dive only costs $50 for zoo members and $65 for non-zoo members. That price includes admission to the zoo, which is $15-$17 on its own anyway. The regular scuba dive with sharks is more costly; $160 for zoo members and $175 for non-zoo members. You must make reservations for both in advance. Tove bought me the Eye-to-Eye Shark Dive for Christmas and we couldn’t even get in until April. Where else can you experience a view like this? An Eye-to-Eye Shark Dive at Point Defiance Zoo & Aquarium is a unique, magnificent, thrilling, mind-blowing (the list of words goes on forever) adventure. Tove and I both agree that it’s one of the most incredible activities we’ve ever done together. For hours (and even days) after our dive, we were talking about how awesome our experience was. I’m pretty sure we broke a record for how many times two people asked “Can you believe we dove with sharks?” in a 24 hour period. Yes, it was really that special. I can honestly say I will never, ever, ever forget my Eye-to-Eye Shark Dive. Have you ever taken part in an Eye-to-Eye Shark Dive at Point Defiance Zoo & Aquarium? How was your experience? We’d love to hear all about it! Please leave a comment below or connect with us on Twitter, Facebook, and Google+. 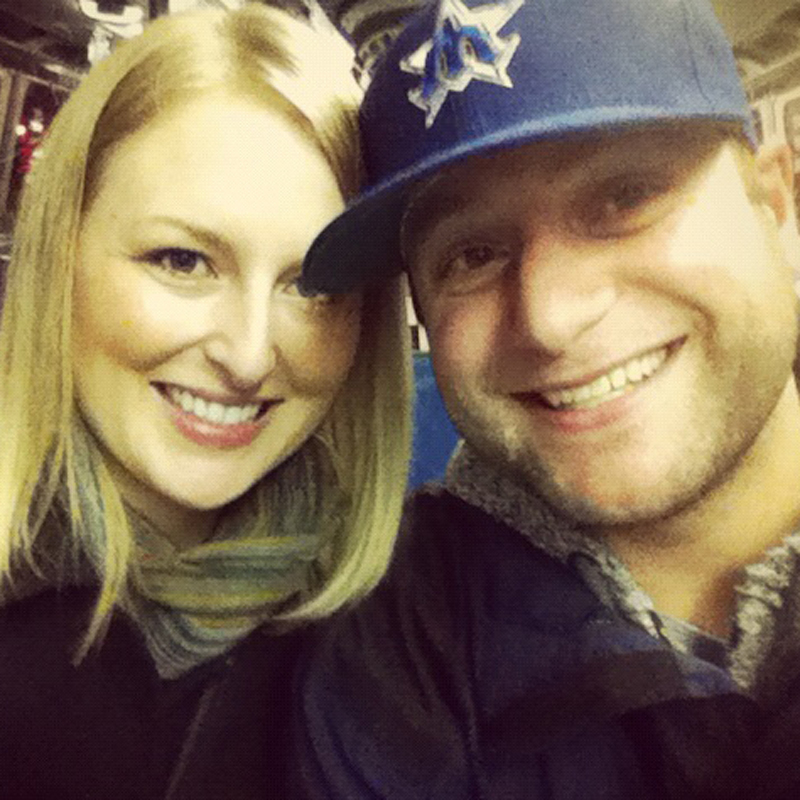 Don’t forget to also visit Seattle Bloggers for more cool things to check out around the Puget Sound. You can also click here for more information on an Eye-to-Eye Shark Dive at Point Defiance Zoo & Aquarium.